The Kings Arms Hotel is part of the second oldest building complex in the town, the 16th C Tudor Mansion which commanded the whole block at the top end of Fore Street (formerly High Street), Queen Street (Market Street), North Street (Back Street), and Malthouse Lane (Taprell or Hicks’ Lane). Records show that a William Taprell was an innkeeper in 1672, most probably on this site; the Taprell family, originally chandlers from St Neot, leased the Mansion House for many decades during the 17th and 18th C. The will of Ralph Taprell in 1703-1704 refers to the Kings Head House and the adjoining Town House. After the introduction of the Turnpike Acts in the 1740s and 1750s, roads in Cornwall improved greatly, allowing regular Stage Coach services through the county, and Lostwithiel became a staging post. It is noticeable today that all the Public Houses in the town have Stables and Coach Houses either adjoining or nearby and this is evident on the Queen Street side of the Kings Arms Hotel. The old Coach House and Stables building was used as a garage, and above is a large room known as The Long Room, with Victorian windows and staircase. According to archaeologists and historians who looked at the building in 2008, the present building is 18th C, with the inside staircase of the same period. A doorway from the hotel into the Mansion House, now Edgcumbe House, is still visible, although now sealed up. Outside in the courtyard, which once would have led into the Mansion House, there are four phases of building. The windows in this area are 17th C and 18th C or possibly earlier. The chimney stack is also 18th C. Along Queen Street and on the corner of North Street was the Cooperage, now a private dwelling. The establishment was known as The King's Head during the first half of the 18th C, but by 1756 the name had changed to 'The Kings Arms in Fore Street' and it was being leased by Richard Foster, the son of Richard Foster, tanner. By 1775 Nevel Norway, the owner of the newly built Norway House beside the Quay, had leased the Kings Arms from Lord Edgcumbe. Nevel Norway’s lease preceded that of the Leavers family in the 1790s. Lord Edgcumbe sold the property in 1837 for £800, to the then innkeeper George Reed and Thomas Robins, who immediately sold it on to Thomas Adams. By this time Lord Edgcumbe had built the impressive Talbot Hotel in North Street. The Kings Arms changed hands two years later for £950, but a few months later at the end of 1839 John West bought the hotel for a much reduced price of £580. 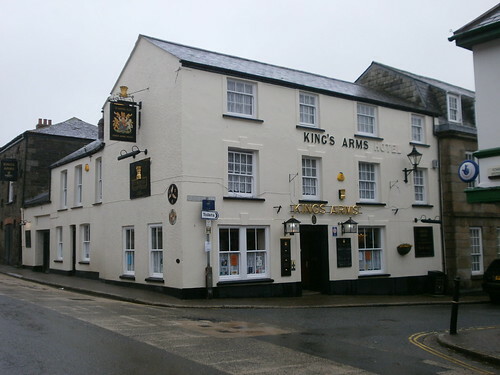 John West and his wife Martha (nee Stephens) ran the Kings Arms as a Commercial and Posting House for many years, and their daughter Amelia (Milly) married widower John Santo, the son of Hugh and Jane Santo from nearby Hillyar in Bodmin Hill. Although the family ran the business for twenty years, it was leased to Robert Kemble before the West family finally sold the property in 1882, to Abel Hannah for £800. By 1893 the property had changed hands again, profitably this time; the premises were sold for £1,150 and four years later for £2,000. The new landlord was James Harris Rosevear. Thomas Eyles Pearce followed at the turn of the 20th century, when it became fashionable to include the family name, hence ‘Pearce's King's Arms Hotel’. The imprint of the Pearce name can still be seen when the sun is shining on the front wall. The succeeding family changed it to ‘Watts’ King's Arms Hotel’ but during Frank Watts' time the addition of family names on hotels was disallowed. In 1919 Mr Percy Livermore Chilwell rented the hotel for £47 p.a. (later reduced to £36) and by 1922 Walter Hicks and Co., the forerunner of St Austell Brewery Company had purchased the premises. Mr Chilwell, his wife and four daughters lived at the hotel until his wife died ,and with the proposed new road coming through Queen Street, in 1936 Mr Chilwell decided to leave. At this time the Kings Arms consisted of a Dining Room to the right of the front door, Smoke Room and Snug to the left of the front door, Kitchen, 7 Bedrooms, Indoor Sanitation and Large Club Room (Long Room). Rent was £36, Licence £30, Rateable Value £55/Net £43. Trade in 1933 amounted to £922, in 1934 - £871 and in 1935 - £956. Thomas Jewson, his wife and family then took over the premises and for many years ran a successful drinking establishment with very successful Darts teams. Mrs Jewson let out rooms, especially to travellers; Lostwithiel Creamery had been built in 1932 and for many years employees who came from different parts of the country were happy to live at the King's Arms. During WW2, the Long Room was let out to the War Department, who renovated it after the war’s end, putting right any damage the Spanish troops had incurred. The Long Room continued to be a popular function room, and for many years after the war was used for parties, wedding receptions, and as a practice room for Lostwithiel Town Band. It was the place to be in the 1950s when Rock & Roll came to this country from the USA. In the 1970s Jude Martelli ran a successful Folk Club there. However it is now considered unsafe for public use. Mr and Mrs Jewson ran the hotel for over twenty years and since their retirement in the mid-1960s many landlords and landladies have managed the Kings Arms. The ground floor has been converted from the then Dining Room and Public Bar to one large Bar. The present landlords, Will and Kerry, show live sport on large TV screens, and put on live music at weekends, as well as the ever popular Darts and Pool. The large garage underneath the Long Room has recently been turned into a popular Indian Restaurant. Each tenant, landlord and or landlady, endeavours to keep up with current trends, which adds to the continuing success of this Lostwithiel establishment. Words - Gillian Parsons Published in Lostwithiel Newsletter June 2018 as part of the My Lostwithiel series.